The Sea Shepherd Conservation Society ship, Steve Irwin, was raided by Australian Federal Police officers last night. The ship had docked in Hobart at about 5:30pm when AFP officers brandishing a search warrant boarded, thoroughly searching crew members and the ship. Among items confiscated was the ships log and video tapes exposing Japanese whalers slaughtering whales in the Southern Ocean. Crew members have described the slaughter by whalers as incredibly distressing as the whalers became more brazen. The crew has reported a whale was slaughtered in full view of the Steve Irwin. The frustration and desperation of the whalers has not only made them more willing to kill whales in front of the Sea Shepherd but more violent towards the activists. The Japanese whalers have thrown scrap metal at activists, and employed water cannons and fired military-grade sonic weapons in an effort to stop the activists from protecting whales. The Sea Shepherd Conservation Society remains the only entity that directly confronts the illegal practice of slaughtering whales in a sanctuary. Both the United Nations and the Australian Federal Court have made the commercial slaughter of whales illegal and forbidden whaling in the Southern Ocean whale sanctuary. Despite these laws, Japanese whalers continue to slaughter thousands of whales each year and the Australian government continues to do nothing! The Australian government has used the image of Steve Irwin and the environmental spirit of Australians to promote the country on the world stage. Now that the AFP have raided the ship named in honour of Steve Irwin, can the hypocrisy of the Rudd government be hidden any longer? The majority of Australians oppose the whaling in our waters and the continued activism of the 100% volunteer based Sea Shepherd is example of what Australians will do to support those that protect whales from extinction. 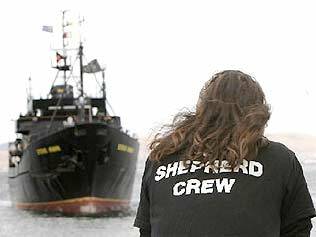 What is to come of the police raid on the Sea Shepherd ship? The log book is a record of all the movements the Steve Irwin made on its operation and the video is a damning record of the violent and illegal activities of the Japanese whaling fleet. Captain Paul Watson has made the statement that he is unaware of whether the raid was made in response to complaints by either the Japanese whaling companies (controlled by organised crime groups in Japan) or the Australian government. It should be a worry for all Australians that the Federal Government puts trade relations with Japan before the values of the population and the protection of heavily endangered whale populations. What can be done to support the Sea Shepherd and tell the government we oppose their support for criminals? 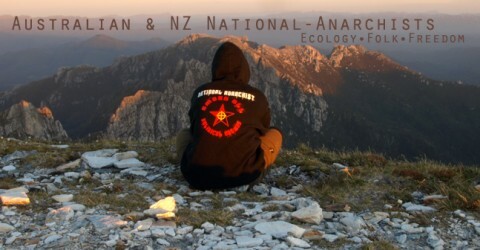 The Australian National-Anarchists support the Sea Shepherd Conservation Society with donations and letters will continue to be written to government officials including Environment Minister, the dishonourable Peter Garrett demanding the government serve the interests of Australians and protect whales in our waters. We must take a stand to protect our marine life from becoming another subject of history. We cannot wait for the Japanese government to control its whaling companies, we cannot expect government to enforce its own laws. The Sea Shepherd is the only entity preventing the extinction of whales and it is the duty of everyone to support them in their time of need. Uhhh, right… Since when do whales belong to Australia? Whaling itself isn’t widely popular in Japan, it’s mostly the organised criminal elements in Japan (Yakuza) that are controlling the whale trade. Australian Bushfire Tragedy Torquay Urbanisation? Say NO!